Streams of mourners started descending during the weekend on the Oslo Cathedral, itself damaged by Friday’s terrorist bombing in the heart of the Norwegian capital. They left flowers and candles as they paid their respects to the now-more-than 90 persons killed in the attacks, and lined up Sunday morning for a special memorial service. The regular Sunday service in the cathedral, often used for state occasions and royal weddings, took on new dimensions following Friday’s deadly and destructive bombing in Oslo and a subsequent massacre of young members of the country’s ruling Labour Party. The cathedral’s chief pastor chose the theme of “faith and hope,” and the service was broadcast live on national TV. In addition to the hundreds who started lining up hours before the service began at 11am came a stream of top government officials and members of the royal family, all in mourning themselves. Prime Minister Jens Stoltenberg, who has been dealing with the tragedy constantly since it began Friday afternoon, King Harald, Queen Sonja, Princess Martha Louise and the leader of the Labour Party’s youth organization, Eskil Pedersen, who survived Friday’s massacre, were all on hand to share their grief and show support for the victims and their families. Another special church service was being held in the historic Norderhov Church in Ringerike on the Tryi Fjord, not far from where the massacre occurred on the island of Utøya. Both Crown Prince Haakon and Crown Princess Mette-Marit were attending it, along with many of the survivors who have been staying in a crisis center at the nearby Sundvollen Hotel since being rescued Friday evening. Stoltenberg, his diplomat wife Ingrid Schulerud and Pedersen all left their own single white rose on the mounting pile of flowers left by mourners over the weekend, before the bells of the recently renovated cathedral began to ring. The service was also attended by other leaders of opposition parties in Parliament including Trine Skei Grande of the Liberal Party (Venstre) and Knut Arild Hareide of the Christian Democrats (Kristelig Folkepartiet). The Oslo Cathedral (called Domkirken in Norwegian) is an important gathering place for Norwegians and also often used as a place of refuge, most recently by asylum seekers whose applications have been denied. The man arrested and charged with the terrorist attacks on Friday has confessed and written that he sought to stop immigration and opposed Norway’s emergence as a multi-cultural society. 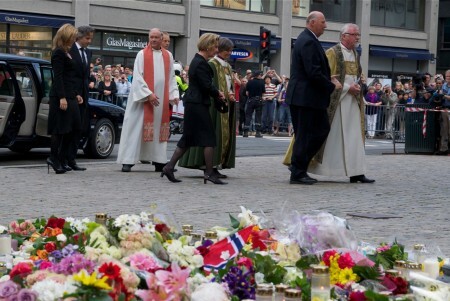 Many other churches and also mosques were staying open all over Norway on Sunday to receive mourners from all faiths. Many of the messages of sympathy left among the flowers and candles were from muslim organizations and also a Palestinian refugee group, who expressed their support for the mourning Norwegians. It may perhaps be unprofessional of me to admit this, but I have written the above paragraphs with tears in my eyes. After living and working in Norway for the past 22 years, I have found it nearly impossible to fully distance myself from this tragedy that has so deeply affected so many of my friends, colleagues and family here in Norway. We have been working long hours since Friday to try to keep you all up to date on what’s happening in this otherwise peaceful country, but it hasn’t been easy. I have also been somewhat distracted by dozens of calls from international media seeking help and extra coverage of unfolding events, and I have wanted to accommodate them as well. I thank all of you who have sent messages of support and sympathy, either through e-mail or through our comment function, and we apologize for being unable to respond to you all. We will continue to do our best to cover events as they unfold, and will appreciate your patience and support.